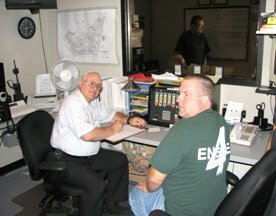 The Communications and Cascade Division is a group of dedicated people trained to relieve the 9-1-1 dispatcher of having to handle fire department communications once a call has been dispatched. Our group is also responsible for refilling the air bottles using the “Cascade System” on the incident scene. 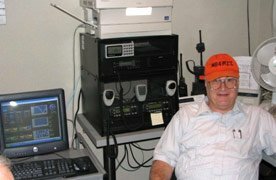 In 2005, a group of volunteers, who happened to be amateur radio operators (hams), were invited to help to rejuvenate a decade old function within the Department. 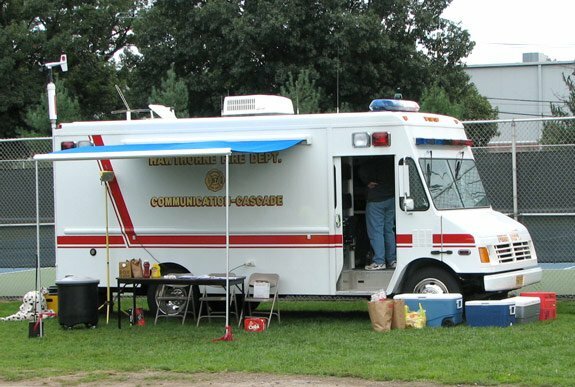 To relieve some of the workload from the Borough 9-1-1 dispatcher, volunteer firefighters would take over fire department communications, particularly in the event of a working fire. Typically these volunteers were on light duty because of an injury or other issue. These firefighters would also man the Cascade Unit at working fires. The Cascade Unit is responsible for refilling the bottles of the self-contained breathing units worn by the firefighters. Firefighters don’t like to stay in the firehouse when the alarm is sounded. They prefer to be “fighting fires and saving lives”. This leads to periods when no members were available to assist with the communications or the cascade system. It was decided in 2005 to establish a core group of volunteers who would be dedicated to communications and the Cascade Unit. 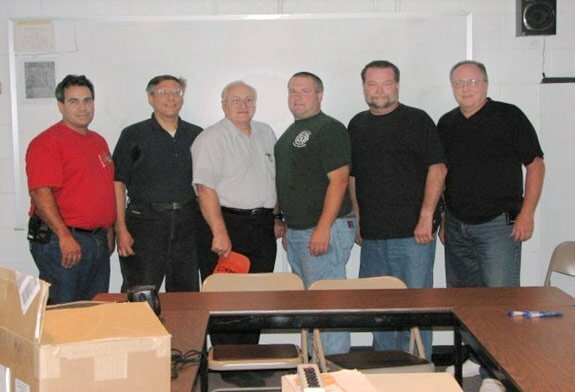 A group of ham radio operators involved in emergency communications began meeting at fire headquarters. It was reasoned that these ham operators were already experienced radio operators and it was determined that the group would be well suited to handle these tasks rather than fight fires. 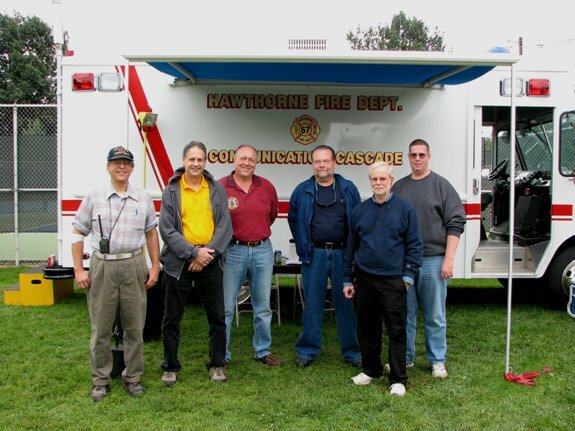 The ham radio operators became members of the Hawthorne Fire Department and have taken fire department classes to become familiar with fire ground tactics and terminology. 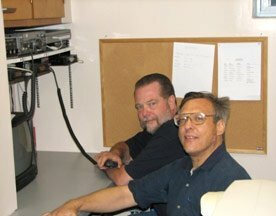 Our radio operators and other volunteers who want to actively support the fire department, but are not able to haul hose and go into fires make up the Communications and Cascade Division of the Hawthorne Fire Department. Handling communications from fire headquarters and manning a mobile communications/cascade vehicle are the primary functions of the group. Unit 57 is equipped to communicate with all mutual aid fire companies as well as agencies in both Passaic and Bergen Counties. This vehicle includes a mobile cascade system capable of filling the air bottles with breathable air at the scene of an incident. 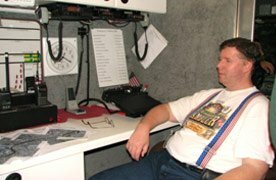 It is not necessary that you be a ham radio operator or have any fire fighting experience. We can teach you all you need to know about the radio and cascade systems. To be part of the Communications and Cascade Division, you must be able to verbally communicate clearly in English. You must have a willingness to learn. You must be willing and able to respond to calls, either day time or night time. You are not required to meet the same physical requirements applied to fire fighters who pull hose and enter burning buildings. Contact us and let us give you more details. We meet at Fire Headquarters most Monday evenings at 7 PM. 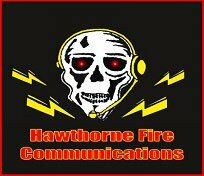 Drop by and see us or email us Communications@Hawthornefire.org.